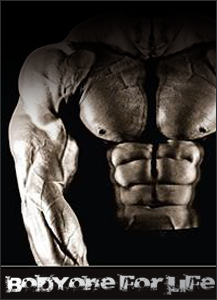 BODY ARMOR can increase your body’s anabolic hormones for increased strength, performance, and muscle size without the side effects often associated with prohormone use; it can add quality lean muscle; it can reduce the conversion of Testosterone to DHT and estrogen, thereby maintaining maximum serum testosterone levels; increase power; and maximize your body’s ability to recover. BODY ARMOUR "mimics" the effects of anabolic pharmaceuticals by enhancing protein synthesis, nitrogen retention (positive nitrogen balance), and nutrition-partitioning (diverting more nutrients to lean mass over body fat), while simultaneously reducing muscle catabolism (wasting). BODY ARMOUR can help potentiate your body's production of all five anabolic hormones: (1) Testosterone; (2) Human Growth Hormone (hGH); (3) Insulin-Like Growth Factor 1 (IGF-1); (4) Luteinizing Hormone (LH); and (5) Insulin. Best of all, BODY ARMOUR can do this without the androgenic side-effects associated with prohormone use or over-stressing the liver. But BODY ARMOUR is more than just an anabolic primer. It can help your body block the conversion of testosterone to estrogen and dihydrotestosterone (DHT); support your liver; increase energy for "unreal" performance; and provide key vitamin and mineral support for your muscles. If you want to be an animal, you've got to train like an animal. Now, you can without all the prohormones or ephedra.